now announced their first special guest to perform with them on this epic night – Scouting For Girls! Liz Doogan-Hobbs MBE, promoter of the Grandslam Madness Tour, added: “We are delighted to announce that Scouting for Girls and Chainska Brassika will be performing with Madness in Lincoln. This show is the start of the whole UK tour and Lincoln deserves the best line up we can deliver. Scouting for Girls are a pop-rock band from the United Kingdom. Over the course of four sparkling, life-affirming, Top 10 albums they have made the journey from playing pubs in London to headlining Wembley Arena. 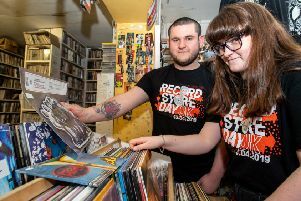 They have sold over two million records along the way. Childhood friends from London, they are Roy Stride on piano and lead guitar/vocals, Greg Churchouse on bass guitar and Peter Ellard on percussion. They formed in 2005 and released their self-titled debut album that September which reached number one on the UK Album Chart and went triple platinum in terms of total sales. Between Us, which debuted at number 10 on the UK charts. Their fourth album Greatest Hits was released in July 2013, and reached number eight on the UK charts. This band have a very loyal fanbase and a great set of hits to perform. Scouting for Girls enjoy a great career touring and writing songs, but not just for their own performance. Roy has embarked upon a sideline of writing songs for others including One Direction (‘I love how Scouting for Girls have been bringing feel good pop music to Britain in the past years.’ – Louis Tomlinson, One Direction), Olly Murs and Alexandra Burke amongst others. Chainska Brassika are a nine-piece ska-fuelled, energetic reggae and dub band from South East London. Their lively old-school ska sound combines with the energy of today’s bass culture and commands any audience to get up and dance. Over the summers of the last few years, ChainSka have appeared at major UK festivals such as Glastonbury, Bestival, Secret Garden Party, One Love and Boomtown Fair and supported the likes of The Skatalities and The Abyssinians. The Grandslam Madness tour, which runs from May to September 2015 will take in 20 shows at some of the greatest sporting venues around the country, including racecourses, cricket grounds, rugby and football stadiums as well as the world famous racing circuit at Silverstone. Madness will be performing inimitable quirky pop classics such as “House of Fun”, “Baggy Trousers” and “My Girl”, iconic songs that are guaranteed to draw you in, get you dancing and singing along. And Scouting for Girls will be performing all their loved hits too, making Friday, May 29 at Sincil Bank, home of Lincoln City Football Club a fun, dynamic and hugely enjoyable evening.